Civil disobedience, is the non compliance with unjust laws or rules of government or occupying force. Sometimes called non-violent resistance. When it comes to the fight for animal rights, it is something that I believe is important, because too often, those who defend animals, even in non-violent ways are classified as terrorists. When a government criminalises compassion, you know that animal liberation has governments running scared. And those who would fight, are frightened into submission. Martin Luther King was a Reverend, therefore, when he talks about breaking unjust laws, he could be seen as preaching. Christianity, however, for those who believe in the infallibility of the christian bible, it can provide inspiration, a role model of actions that can be used to fight unjust laws. And for those who don’t believe, enjoy turning the bible back on those who preach Christianity, but sometimes forget its teachings (eg: Thou shalt not Kill). “Do not repay anyone evil for evil… If it is possible, as far as it depends on you, live at peace with everyone… Do not take revenge….” (Romans 12:17-19) If it is possible, doesn’t mean always. 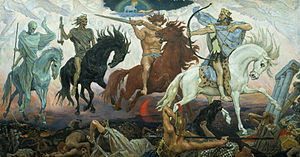 The book of Revelations, offering a full menu of diabolical fare – apocalypse, confrontation between good and evil, the four horsemen of the apocalypse, riding white, red, black, and pale-green horses representing conquest (or pestilence), war, famine, and death, cries for vengeance, hail and fire destroy a third of the trees and grass, a third of the oceans are destroyed, a third of the rivers and springs are poisoned, a third of the sky is darkened, a plague of “locusts” terrorise the Earth, an army of 200 million kills a third of Earth’s population, and the sun scorches the Earth with intense heat. … Does that describe humans or animals?